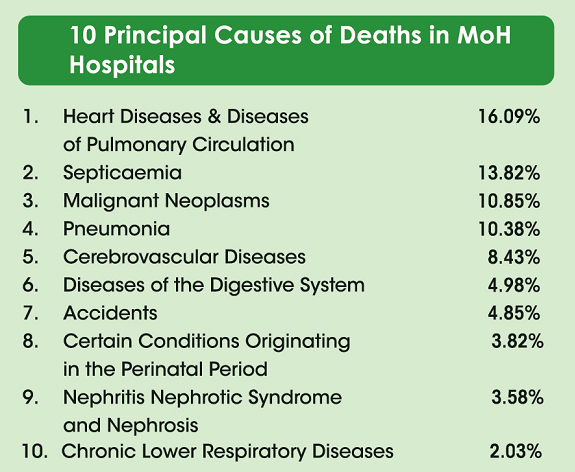 When compared with cause #7 (Accidents), the top causes of death #1 to #5 DO NOT HAPPEN BY CHANCE. They happen when we are ignorant or deliberate with our consistent actions and thoughts that do progressive harm to our body-mind-emotion, in the long haul. Obviously when the heart is clogged, it cannot pump blood to the lungs and thus hamper the oxygenation process. At the same time, fluid in the lungs can't drain efficiently, resulting in the patient literally "drowning' in the lungs. Factors that contribute to heart failure or attack include cholesterol disorder, blood pressure, diabetes, obesity, and of course the least understood contributor known as INFLAMMATION of the blood vessels (which is about 100,000 km long). What causes the cholesterol disorder, blood pressure, arterial hardening, and inflammation of blood vessels? While you are thinking, let's proceed to the next killer. Septicaemia is a potentially life-threatening infection in which large amounts of bacteria are present in the blood. It is commonly referred to as Blood Poisoning. The condition usually begins with fever and chills. Drenching sweats may occur. The heart rate and respiratory rate (number of breaths per minute) rise in association with the rising fever. The affected individual will feel very ill indeed with profound feelings of weakness. As the condition evolves the person may begin to feel very cold and clammy. The blood pressure starts to fall and the person may lapse into unconsciousness. Obviously, it appears that the immune system is not working in this case. So, what has happened to our resilient immune system which is supposed to protect us from the invasion of bacteria, fungus, virus, chemical, parasites, and all other "invaders"? Pneumonia is a lung infection that can be caused by different types of microorganisms, including bacteria, viruses, and fungi. Symptoms of pneumonia include cough with sputum production, fever, and sharp chest pain on inspiration (breathing in). Again we are being brought back to the "germ theory" that has indoctrinated us from young till now. Let's get this clear: "houseflies don't cause garbage; but garbage will result in the breeding of houseflies, plus other creepy crawlies." Hence, our body must be in a "garbage condition" in order to attract and cultivate the growth of pathogenic organisms such as bacteria, viruses, and fungi. Disease of the blood vessels and, especially, the arteries that supply the brain. Cerebrovascular disease is usually caused by atherosclerosis and can lead to a STROKE. So if you have seen a stroke survivor before, you do not want to be in their position, right? But the fact is, STROKE will continue to claim lives to maintain its top killer position, year by year. Here again the argument is somewhat similar to the #1 killer listed above. To extend the existing questions further, here we ask: "what contributes to atherosclerosis, the clogging and hardening of blood vessels?" 1. Diseases don't happen by chance or by accident. They are the result of our daily deliberate or ignorant "thoughts – emotions – actions" that we carry out to progressively harm our bodies. 3. Understand that your personal Productivity, Self-esteem, and Freedom, may just vanish overnight due to a sudden heart attack or stroke or septicaemia, which will remain the top killers worldwide, claiming the lives of the ignorant and the presumptuous. 4. Learn to pursue your Birth Right: an energetic body, mental clarity and emotional balance for life. Now that is the true meaning of "Health is Wealth !" All other priority and pleasure of life with come after that, if you do agree with me. 5. THE BEST PRESCRIPTION I WILL GIVE TO YOU IS – EDUCATION. This will encompass the Root causes of a disease and the dynamics of Complementary/Alternative medicine modalities. I call this the 360º Patient Centric approach. Its all about you.